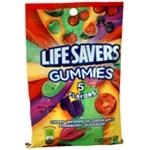 Enjoy this variety pack of candy that offers 13 delicious flavors, including lemon, watermelon, grape, fruit punch, pina coda, tangerine, banana, melon, mango, orange, pineapple and lime. 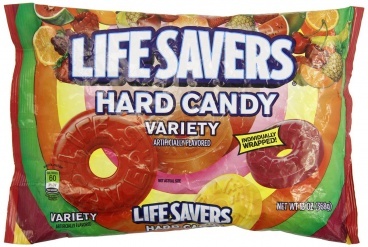 Each fruit-flavored candy is individually wrapped so you can keep a supply of Life Savers with you at all times. Sugar, Corn Syrup, High Fructose Corn Syrup, Citric And Malic Acids, Natural And Artificial Flavors, Colors (Red 40, Yellow 5, Blue 1), Dextrose, Soy Lecithin.